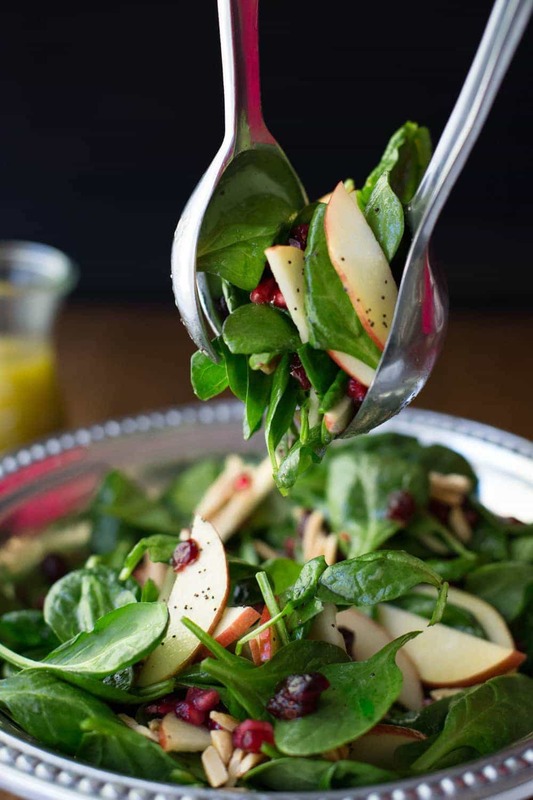 Apple Cranberry Spinach Salad with Honey Cider Dressing – an insanely delicious and super healthy salad – perfect for any get together with family and friends! I’m super excited to share this wonderful Apple Cranberry Spinach Salad with you. I took it to our small group get together this past week and everyone wanted the recipe. So, I figured you might too! “This salad is insanely delicious”, “What kind of dressing is this? It’s so good!” and “Please tell me this is on the blog!” Those were just a few of the comments that swirled around the kitchen that evening. It seemed that everyone truly enjoyed it. I don’t know about you, but our 2016 holiday calendar is already beginning to get speckled with a few parties and get-togethers. This seasonal salad would be the perfect dish to serve or bring along to any holiday occasion, as it will be sure to be very popular. Furthermore, it’s easy to put together, feeds a crowd and is pretty enough to elicit lots of oohs and aahs. I know I’ll be using the delicious dressing on lots of salads in the days ahead. It’s beyond easy to make, as you just throw everything in a jar and give it a good shake. Since there are no unusual ingredients; just olive oil, honey, cider vinegar, crushed garlic, salt and pepper, you probably already have everything you need right in your pantry. I also add a scoop of poppy seeds, just because I think they’re just so darn pretty. However, if you’re not a poppyseed fan, just omit them. I have a feeling this Apple Cranberry Spinach Salad is going to become a favorite at your house like it already has at mine. This is a little embarrassing, but we’ve already enjoyed it twice this week – and it’s on the menu for dinner tonight too. It’s that good! So pin it while you’re thinking about it so it will be easy to find when those holiday invites start rolling in. Bon Appetit! Don’t pay an arm and a leg for the prepared seeds. Check out this easy tutorial – The Easy Way to Remove Pomegranate Arils, no water, no mess, no kidding! 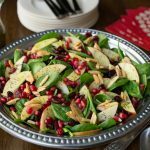 Apple Cranberry Spinach Salad - an insanely delicious and super healthy salad - perfect for any fall/holiday get together! For the salad, combine spinach and apple slices. Drizzle 1/4 cup of the dressing over the salad. Top with dried cranberries, pomegranates and almonds. Toss before serving. Pass extra dressing at the table. The cranberries can be prepared a day in advance. Set aside to cool, then refrigerate in an airtight container. Remove from refrigerator and hour before serving. The dressing can be made up to 1 day in advance, covered tightly, and refrigerated. Remove from the refrigerator an hour before serving. The almonds can be toasted up to 1 day in advance; store at room temperature in an airtight container. ** Intimidated by pomegranates? Don't pay an arm and a leg for the prepared seeds. Check out this easy tutorial - The Easy Way to Remove Pomegranate Arils, no water, no mess, no kidding! I think the cider definitely helps to prevent browning. You could also place the apples in a small bowl, add a bit of the dressing and stir to coat before adding them to the salad. That will ensure that each apple is coated. Delicious dressing and salad combo. Thanks and Merry Christmas! Hi Kristin, I’ve used both with great results! Perfect salad for our church progressive dinner last night…not a leaf left in the bowl. I will double the recipe next time! Dressing was fabulous too! Thank you so much for this delicious recipe. We served it last night for our first of a few holiday gatherings, and it was the talk of the evening!! You have a wonderful selection of recipes and I look forward to trying more! Thanks so much Audra! I’m so happy you and your guests enjoyed this salad. It’s definitely one of our favorites! Merry Christmas to you! This is the original recipe given to me by a friend Jeanette years ago and it is still one of my favorites. See below for variations and additions I have made over the years. Use your imagination. Mix together everything except blue cheese in the bottom of the bowl or in a jar and shake well. When you are ready to toss your salad add the blue cheese and go for it. Mandarin oranges, drained – dried fruit, such as cranberries, cherries, blueberries, tropical fruit, etc. – fresh sliced fruit; strawberries, or any other berry, sliced apples or pears, cherries, halved. Thinly sliced carrots, celery, red onion, cucumber, avocado, raw mushrooms, Grape tomatoes, either whole or sliced in half. Nuts (walnuts, pecans, sliced almonds, hazelnuts – try toasting them in a 325-350 degree oven for about 6-7 minutes. 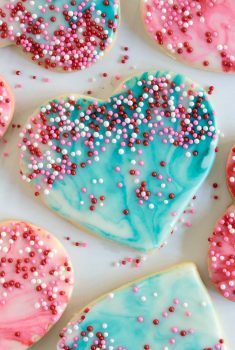 Be careful not to burn them – or sauté a little butter and granulated or brown sugar (have also used Splenda, white or brown), add about a tablespoon of water and sauté 5 minutes, then put on a cookie sheet and bake for about 10 minutes. 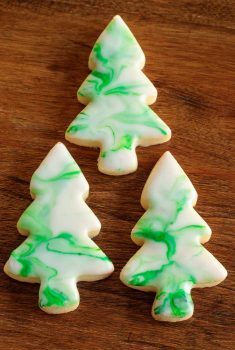 These can be made ahead and kept in a zip lock bag or air tight container for quite awhile. I always have some on hand. Hubby just loves to munch on them. Oh! 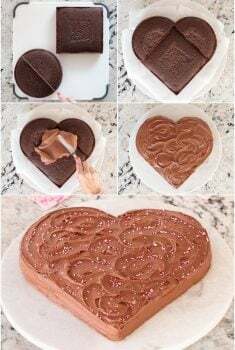 This one is a winner, and easy enough to be a frequent treat! This salad looks so beautiful and sounds delicious, I want to make it for Thanksgiving. I am not sure what to do with the clove of garlic, is it left whole, minced, chopped, or crushed, and do you just leave it in the dressing ? Thank you for another great recipe! It is minced Gail, I’ve added that to the recipe. Thanks so much and ENJOY! Thank you Chris, cannot wait to make it on Thanksgiving, sure everyone is going to love it, and it looks so festive for the holidays! I made this on Thanksgiving, looked so pretty, was delicious, and everyone loved it! Thank you Chris for another great recipe, your blog is my absolute favorite ! Oh my, made this last night and it is to die for! Absolutely perfect combination. I love the apples with the dressing,. This is going to be on my Thanksgiving table. I like to serve some sort of green salad on Thanksgiving. With all the heavy food, it just seems the right thing to do. Thanks for the wonderful recipe. You’re so welcome Karen! I love how salads can lighten any meal, don’t you? You make the best darn salads, Chris! Such a delicious choice of ingredients. Do you dream up dressing ingredients in your sleep? lol. Perfect! Robyn, you know me too well! My mind is constantly whirring with taste combinations for salads and dressings! Scott calls me the “crazy kitchen chemist”. Your salad is a thing of beauty, Chris! Pinned! Oh thanks for the sweet, sweet compliment Susan! I’m with you on mixing up salad dressing by shaking it in a jar. So easy and convenient! Anyway, this looks inspired — such nice flavor. Thanks! Thanks John, you’re so kind! I love simple. Such a gorgeous, crisp salad! 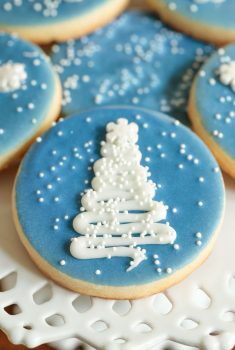 This is just perfect for the holiday menu! It really does have great holiday colors, doesn’t it Laura? What a great salad. I do something similar only with fresh cranberries and hazelnuts. Can’t wait to try your version! This is a perfect salad Chris, I actually have all the ingredients to make this tomorrow! Well, have fun in the kitchen tomorrow Jenna! Gorgeous salad Chris, you sure know how to make salads special. Lovely dressing too!! Thanks Cheri! Scott isn’t a total salad fanatic like me, but he loves this one. You are the queen of gorgeous salads Chris. I love all these flavors you’ve got going on. Glad you shared this recipe because I need to make it. Have a wonderful week! Thanks Tricia! You have a wonderful week too! 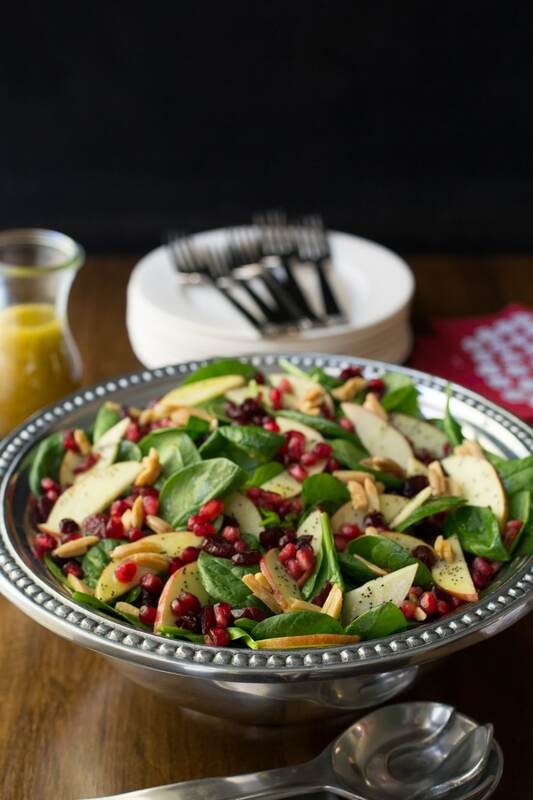 Such a beautiful salad and the apple cranberry pomegranate combination is just perfect for this time of year. Great for entertaining! It is a stunner for the holidays Jennifer – really looks festive on the table! It must be delicious as it is a bit similar to strawberry spinach salada and I love thet..this one has more componets so it has to be even better Chris.Thanks! You’re so welcome Monique! Is it snowing up there yet? This salad looks gorgeous..the colour, texture and flavour…simply perfect, Chris. So sweet Angie! Thank you! This salad is stunning, like all of your salads Chris, and so super healthy too! Thanks Sue! I do tend to love my salads. Seems like there are an infinite variety of combinations to play with! This is GORGEOUS! And it looks like Christmas. It would be great for Thanksgiving or Christmas day. We though so too Ginny! Thanks for your encouragement! Time to pin for the holidays, right?